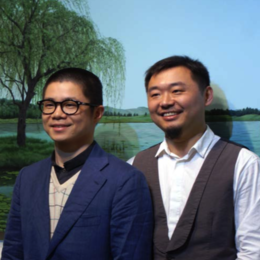 Tamen (他们) is an artist collective composed of two young Chinese artists, Lai Shengyu (赖圣予) and Yang Xiaogang (杨晓钢), who were born in Hunan Province in 1978 and 1979, respectively. The group is alternatively referred to as ‘They’, which is the English translation of their name. As a collective, they reject notions of self and individuality in art by co-painting each work and collaborating in a manner that draws attention away from the individual. Lai and Yang received post-graduate degrees from the Central Academy of Fine Arts in the Department of Printmaking and are currently based in Beijing where they work at Beihang University (BUAA) in the Department of New Media Art. The artist collective Tamen was founded in 2003 based on the artists’ common understanding and ideal of contemporary art. The two artists co-paint, co-operate and co-practice, placing emphasis on communication and dialogue, both in the process and results of their work. Before beginning a work, a general theme and setting may be discussed, while the rest of the conversation occurs through the painting as they alternate working on the piece, continuously adding upon the other’s work, with neither having the right to erase the work of the other. 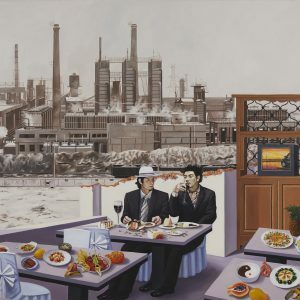 Tamen’s work has gained acclaim in China and abroad for their ability to speak about contemporary China through serene scenes of maddening juxtapositions in vibrant cityscapes (in earlier works) and vast natural landscapes of harmonious cooperation between humanity and nature (in more recent works). Large canvases display Western-style oil painting techniques, thought-provoking conceptualizations, and complanation of the past and present. Often referencing the nature and tranquility typical of traditional Chinese painting and the ink painting aesthetic, the works remain wholly in the context of the contemporary.